Home » Lifestyle » London Fitzroy Hospital becomes MYA flagship location. London Fitzroy Hospital becomes MYA flagship location. As the cosmetic surgery industry continues to grow with popularity and thus expand, it's important for well-known and high quality services to branch out and create more exceptional surgical spaces in which patients can undergo highly specialised cosmetic treatment. 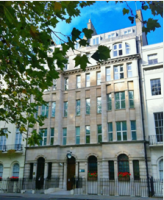 MYA, one of the leading cosmetic surgery companies within the UK, is one such organisation to expand their influence, with their latest move of purchasing Fitzroy Square Hospital in London. This establishment can be found just off Euston Road, conveniently positioned between Warren Street and Great Portland tube stations. The central facility has a vast and dynamic history that has spanned the generations and is in an ideal, prime location, to handle all aspects of cosmetic surgery for patients throughout the United Kingdom. It was founded in the late 1800s as a hospital to support members of the Anglican clergy, with the then named St Luke's Hospital. Despite the hospital projected success, the founder of the idea, Canon William Henry Cooper, decided to move the premises elsewhere in the early 1900s, 1902 to be exact. Thereafter, the two houses that made up the hospital were acquired in Fitzroy Square, however, both weren't initially used at the same time. The first house was rebuilt and opened by Queen Alexander, while the second house didn't receive the same treatment until 1923, when by then it was Queen Mary who opened it to the public. Since that time, there has been a string of royal arrivals at the Fitzroy Hospital, with the Queen Mother and Queen Elizabeth visiting in the late 1950s. Due to its popularity and numerous celebrations, the hospital underwent significant refurbishment in 1994 that wasn't completed until a year later. However, this wasn't to be the last major remodelling that the hospital was to experience, because in 2007 the Fitzroy was extensively refurbished once more. Having become such an affluent and modern institution, in a highly desirable location, it's unsurprising that the hospital was sold privately in 2009, and that now, MYA have sealed the deal to make it their flagship location. The rich history and extensive work done to the hospital perfectly complements and expresses what MYA is all about: high quality and exceptional results. Although there is much work to be done in order to bring the hospital further up to date, and to make sure it's fully CQC registered, observers can expect nothing less than first class service from the staff at the hospital when work is finished in the near future.